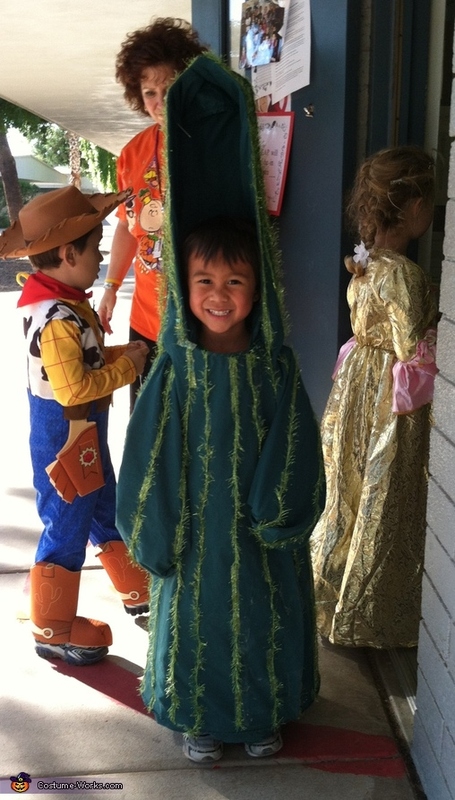 My 5-year old son, Sam, read a book on Saguaro Cactus last year and decided that he would want to be one for Halloween this year. I was trying to use things that we have available around the house. So, I used a tomato round cage, a green bed sheet, double-sided tape, some hand towels to wrap around the shoulder area to give him some padding, and bought some sparkly yarn for the spikes. Next time though I would use something a little less constricting as he has to walk slowly. It was simple to put together as the tomato cage formed the structure. I threw the sheet over, cut to the length I needed, started stitching and pull the things together. I used double-sided tapes to put down the yarn.